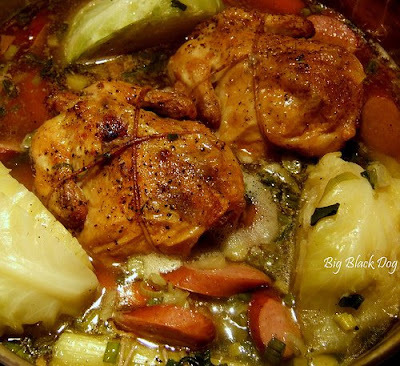 This week for Whisk Wednesdays we made Pintadeaux au Chou or Guinea Hen with Cabbage. I was just not sure if I would like this recipe or not but I knew my husband would love it. I'm not a fan of multiple meat stew like recipes but I trudged forward and was very pleasantly surprised. I really, really liked this recipe. The polish sausage stewed along with the cabbage and hens was just delicious!!! This is not a difficult dish to make. I thought it would take me 2 hours but in reality it took me 1 1/2 hours which is not bad. Due to the fact that we have to cut back on expenses I substituted Cornish Game Hens for the Guinea Hens but that was the only change I made. Prepare the bacon by cutting each strip into 1/4" strips. Put the small strips into a small sauce pan and cover with cold water. Bring to a boil, reduce heat and simmer 1 minute. Drain, refresh under cold water and drain again. In a small frying pan melt 1 TBL of butter. Add the drained small pieces of bacon and fry until crispy. Drain on paper towels. Prepare the Hens by washing in cold water and stuffing with 1 garlic clove, 1 bay leave and 1 sprig of Thyme and salt and pepper. Then rub the exterior with softened butter and season with salt and pepper. Truss the hens and pop them in the oven for about 30 minutes at 425 degrees. Blanch the cabbage, then rinse in cold water and set aside. Over medium heat melt butter and add oil to a large casserole (I used a large frying pan). Add the onion and saute until soft. Add the carrots and cook for 2-3 minutes. Add 2 1/2 c. water. Add the cooled cabbage and Bouquet Garni and salt and pepper. Slice the sausage on a diagonal and add it to the casserole. Bring to a boil, turn down heat and simmer for about 1 hour. Add the drained bacon to the casserole. Cut the polish sausage on a diagonal and add the slices to the casserole. When the hens are out of the oven, carefully put them into the casserole, nestling them in with the cabbage, carrots and sausage. Deglaze the roasting pan by adding 1 1/2 c. water and add to the casserole. Cover and simmer for 20-30 minutes. For our Whisk Wednesdays Post Tail we are all posting our favorite plates. I decided to post my bread plates. Well, I do usually serve bread on these plates but they also work well as small platters too. The plates range from 6-9" by 12-16". It is very difficult for me to pass up any unique shaped serving dish! And it looks like I like polka dots! I will be using Cornish Game Hens as well. Your picture looks wonderful. You know, I don't think I've ever had hen, but this recipe sounds so good, I just might try it! Those are adorable bread plates! I enjoyed this meal too, but would love to have a personal dishwasher to clean up after the event! Ahhh, I love your bagel plate! That's so cute! This looks like a delicious and flavorful meal! I love your serving platters, especially the red one! Your dinner is beautiful! Nice trussing! Your plates are perfect. I love the different colors and shapes. Dinner looks delicious...and I love seeing your platters.. I know you have a lot of lovely things, so keep the show and tell going! Thanks for stopping by my blog. Yes, I adore my German Shepherd. I've shared my home and life with one for the past 28 years. Rotties are a little more than I want to handle right now but I've known some adorable ones, that's for sure. Your blog makes my mouth water and m shopping list grow each and every time I come to visit! What a lovely winter meal. I feel all warm just looking at your photos! And those plates are great. The interesting shapes really appeal to me. Michelle your little birds look beautiful. Also, I love the bread plates. There is some great whimsy there. The cornish hen dishes looks absolutely stunning. What a great job you did with all that...the hens look so perfect. I love your dishes...so creative and fun...table art!